Recently I have downloaded Zbrush software. ZBrush is a powerful digital sculpturing tool that allows you to combine 2.5/3D models along textures and paintings. It is used to create high quality models(up to around 10 million pixels) which can be used in films and games and animations. 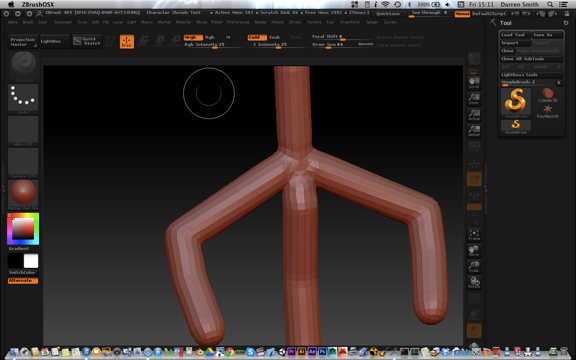 Below is an example of using ZBrush ’s cylinders to draw the body frame. With this program I will be able to develop simple and complex character models which will then be imported into future game projects animation projects. Today I have downloaded a 3D anime character model with ready made animation from Unity asset store. However when I tried replacing the third person prefab construction worker with the new model, however i got some strange animation issues with the character. The issues are the character animations are incorrect, motions like the character keeps jumping while running automatically instead being controlled by the keyboard. Below in figure 1, shows the example of the problem. In order to fix the problem and find the solution, I decided to learn how the character is set up. The character animation is set up using an animation with locomotion controlling the animations for the character. Over the next few days I am going to investigate on how to use animators and animation techniques in order to make a third person game. In my previous third person 3D adventure game, the animation setup was different. Instead of using animators to link the motions, animations were used to link up the animations. This is called the Legacy animation system. However the animations were not perfect and rough around the edges. So another alternative around this is to use a Mechanm animation system. 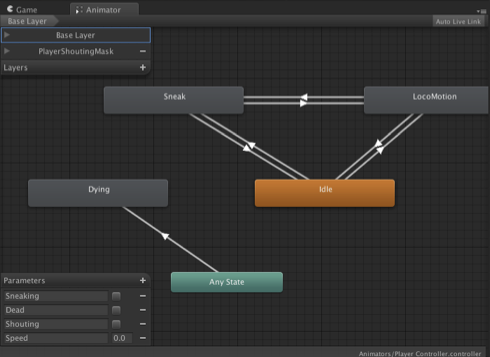 Under this system it is easier to set up the animations and allows a simpler transition from one character to another. 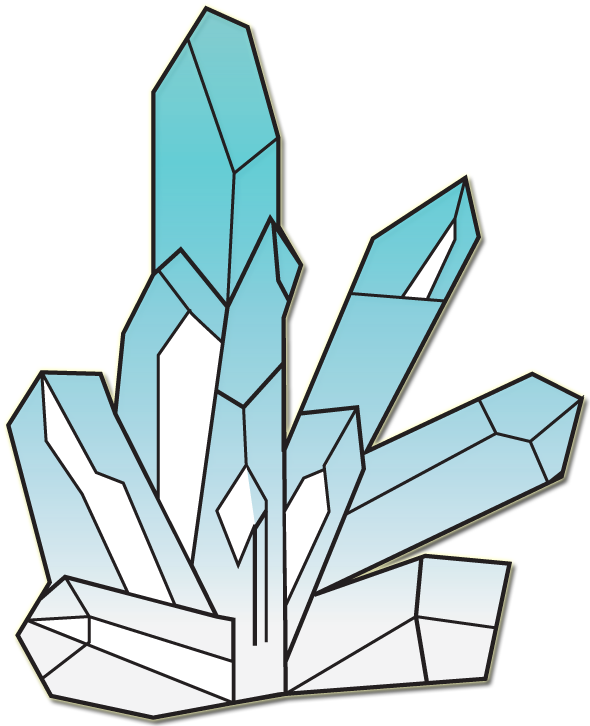 This is illustrated in figure 2 below. To do this a animator is created. This allows you to link the animations using nodes and the inspector to control values and the transitions between each animation as shown in figure 3 below. One you have set up the animations, you link the animation to the character and he is ready to go.